4 stars of deliciously retro horror. Beyond the Gates is written and directed by Jackson Stewart (Invasion Roswell) and is a fantastic nod to the gore fest horror films of the eighties. In 1992, a proud and loving family opened a VHS video store. 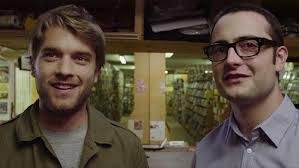 Years later and seven months after the disappearance of their father the two sons, Gordon (Graham Skipper – The Mind’s Eye, Almost Human) and John (Chase Williamson – John Dies at the End) return to the video store to pack it all up and prepare to close down. Gordon has long since moved away and is none too pleased to be back in town with his less responsible younger brother. His girlfriend Margot (Brea Grant – Dexter, Heroes) has come with him to soften the blow and the two of them stay at his father’s house. Despite their reservations, going through all the old memories stored away in the video shop turns out to be a very nostalgic experience for the brothers. That is, until they find the key to their father’s back office, a place they were never allowed to go as children. There, they find a VHS board game called Beyond the Gates and out of curiosity they play the tape. It seems that the only way out of this game once you press play is to finish it and it soon becomes apparent that it may have more than a little to do with their father’s disappearance, as a mysterious gate appears in the basement and the woman in the video refuses to leave them alone. Beyond the Gates is really well put together and even though it is a new film, it could easily have fitted into the eighties horror scene. The idea of a game which comes to life always fascinates and this gore splattered Jumanji-esque story is no different. Clearly aimed at horror buffs, this is the perfect modern B-movie addition to your collection. Beyond the Gates is available to buy now on DVD and digital.